Share buttons are also revealed at the top of this page by scrolling this page down. FeedBack ( 0) Stunning custom home in Valley Ranch! Tucked amongst the pines in the peaceful mountain community of Clio, this 3,362 sq. ft. home proves to be exquisite. The pristinely manicured exterior and grand entry welcome you to a bright, spacious great room. The kitchen, with granite countertops and high end appliances, also offers a generous island and a hallway work desk. Bonus features include geo thermal, oversized pantry, sun room, office, outdoor shed and an extra large 3 car garage with storage. The upstairs provides privacy to guests with their own bedroom, bathroom and bonus area. Situated on almost 3 acres, you can enjoy the privacy and beauty of Valley Ranch and still be just minutes from the picturesque mountain community of Graeagle. Only an hour from Reno/Truckee for all your shopping needs. See www.carolmurrayrealtor.com/ about this home. 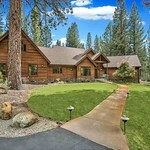 Real estate values have never been better in Plumas County. These eastern Plumas County small towns offer a variety of fabulous real estate opportunities: Graeagle, Clio, Valley Ranch, Mohawk Meadows, Whitehawk Ranch, Gold Mountain, Blairsden, Plumas Pines, and Portola. Plumas County is a place to relocate, retire, rejuvenate ... permanently. Perhaps just a summer place will satisfy ... for now. Plumas County is an oasis from the doldrums of city life. From the stresses we learn to tolerate and let take control of our lives. Plumas County … a place to relax your mind and body; to begin anew, refreshed, cleansed. Real estate news covering Graeagle, Portola, Gold Mountain, Plumas Pines, Whitehawk Ranch, Grizzly Ranch, Valley Ranch, Mohawk Meadows, Sierra Valley, Clio, and Blairsden. Directory of Carol Murray Real Estate Websites and Accounts What's this? The above snippets use Enfeedia's "Super Simple Syndication" eliminating the need to upload any scripts to syndicate feeds. You can explore syndication methods by going to the Enfeedia home page and selecting the "Promote/Syndicate" menu item. You will learn how to fully customize the presentation of the feed on your website. For this feed, use account name carolmurrayrealestate and then select feed plumascounty.